24 year old female 5'4" weighing 125 pounds who lost 75 pounds secondary to improved excercise and dieting. She reduced her weight from 200 pounds to 125 pounds. She underwent a vertical lollipop mastopexy combined with a dual plane breast augmentation using 350 cc silicone gel breast implants. The implant was placed in a dual plane (partially underneath the muscle). 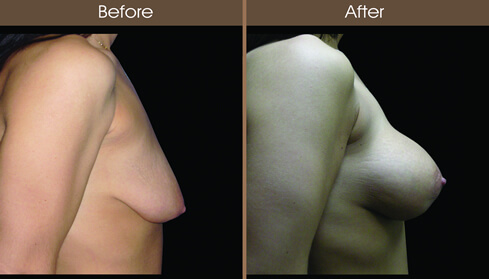 The patient's breast size went from a 34 A/B to a 34C.